The J. F. Costopoulos Foundation and Sissy Papathanassiou, Art Director of Analogio Festival, present the book “Analogio 2005-2017. Dramatic and Stage Writing in Greece”. 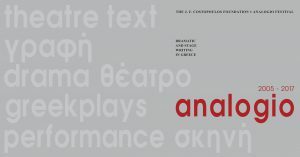 This publication, in both Greek and English, demonstrates eloquently and vividly the successful journey of Greek playwriting in Analogio Festival, from its beginning in 2005 to this day. It highlights the already historic course and the appeal of Analogio on a performing and research level. At the same time this book provides a forum for the theoretical approach of new plays in the form of staged theatrical readings, on the basis of their historical, social and artistic context, in Greece and abroad. It finally underlines the value and the necessity of supporting Greek playwriting and dramaturgy, developing creative dialogue with the theatre of other countries and bringing the Greek audience and playwrights in substantial interaction with the international artistic, literary and theatrical community and audience. The first presentation of the book took place in Athens, at the Amphitheatre of the Benaki Museum / 138 Pireos Street, on Thursday 31 January 2019, and the second presentation followed at the Sarajevo Winter Festival on February 8, 2019. The publication may be obtained either at ALPHA BANK – CULTURE store, 40 Stadiou street, Athens, (www.alphapolitismos.gr/eshop) or at the Bookstore of the Benaki Museum, 138 Pireos street, Athens.